CHICAGO (CNS) — A Catholic hip-hop artist told a crowd of youths gathered for Holy Fire in Chicago that they need to work as hard at their faith life as they do at sports or other pursuits. More than 5,000 young people got the chance to dance and laugh and pray and worship, all in the context of deepening their faith, at Holy Fire at the UIC Pavilion arena on the West Side of Chicago. 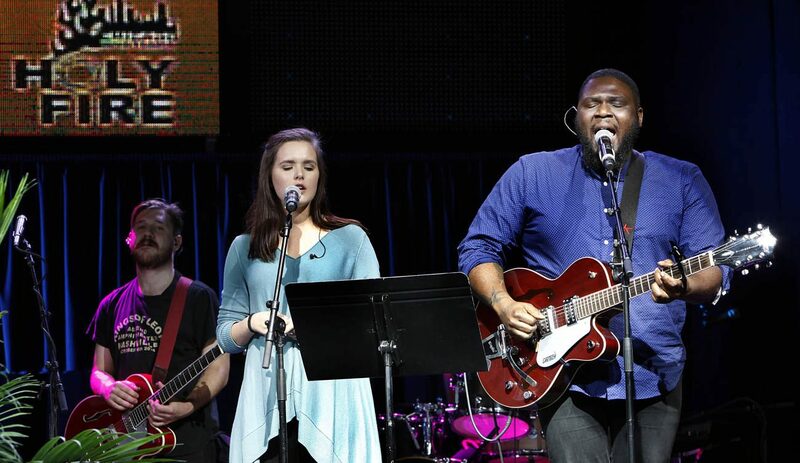 The first-time event featured faith-based music in genres from pop to hip-hop, complete with pounding bass and room for participants to dance in front of the stage. Holy Fire took place Oct. 14 and the daylong program was repeated Oct. 15 to accommodate more middle-school students, which were the target audience. Attendance topped 2,500 each day. Coordinator Rick Moreno, the Chicago Archdiocese’s parish vitality coordinator for the northwest side of Chicago and a number of nearby suburbs, said he was pleased with the turnout. Hosts from Brad Farmer and Gene Monteraselli — who together make up APeX Ministries — used juggling, comedy and the image of saints as spiritual superheroes to draw in participants. Farmer and Monteraselli were among the early favorites of students from Christ the King School, who attended with Lee Ann Arethas, the parish’s coordinator of religious education. While Allison Lewis liked the APeX duo’s juggling and jokes, seventh-grade classmate Madison Runaas said she liked the Oswald Brothers Band, who opened the day. The combination of music and reflection and talks seemed to be doing a good job of engaging the students emotionally, said Chicago Auxiliary Bishop John R. Manz, who heard confessions during the event and celebrated the closing Mass Oct. 14. Dario Salmero, an eighth-grade religious education student at St. Edward Parish, agreed that the day was more engaging than expected. “I didn’t expect that much music,” he said. That was the reaction organizers were going for. Rose Koch, youth minister at St. Michael Parish in Orland Park, brought 135 students from the school and the parish’s English- and Spanish-language religious education programs. Martin is a staff writer at the Catholic New World, newspaper of the Archdiocese of Chicago.